A dump truck overturned Friday afternoon, closing lanes and causing significant delays. The truck overturned just before 3 p.m. on the Woodrow Wilson memorial Bridge in Prince George's County, Md heading to Alexandria, Va. The outer loop local lanes were blocked for at the majority of rush hour. 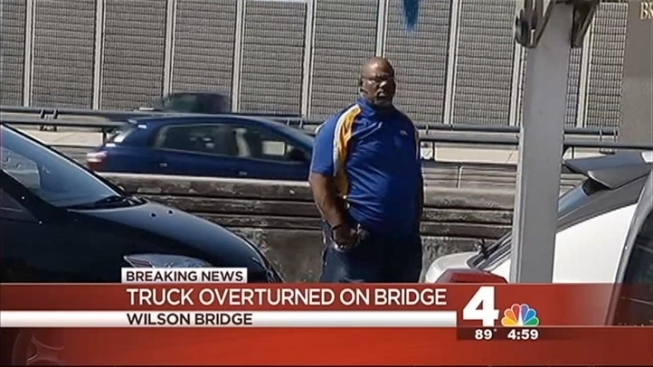 Police report the truck may have leaked some fuel into the Potomac River and hazmat crews responded to the scene. The driver of the truck suffered minor injuries and was not hospitalized. All lanes reopened just after 7:30 p.m.